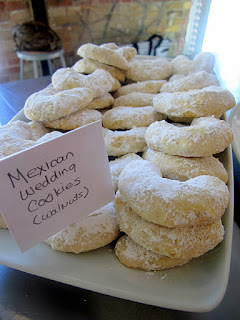 I first made these cookies for a Latin food inspired party this past summer. People went crazy for them, including a Mexican chef who insisted that the next time I visit his restaurant, I am to bring him another batch of these cookies. I didn't expect that reaction but I was definitely pleased. Since then, several people have requested these delicious cookies and after one bite, you'll know exactly why. Enjoy! 1. In the bowl of an electric mixer, cream together butter and confectioners sugar until light and fluffy. 2. Add the vanilla, mix. 3. Whisk together the flour and salt. Add the flour mix to the butter mixture. Mix until just combined, don't over mix. 4. Stir in walnuts with a spoon. Cover and chill the dough for 1/2 hour. 5. Preheat oven to 325F. 6. 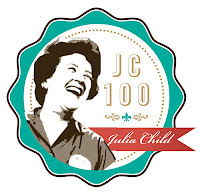 Shape balls of dough into 1 1/2 inch crescents. Place on parchment lined baking sheets and bake for 12-15 minutes or just until the cookies start to turn light golden-brown. 7. Remove the cookies from the oven and allow to cool slightly until they are cool enough to handle. 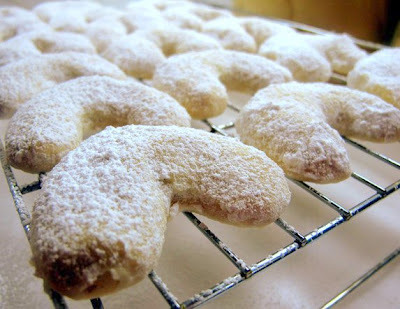 Roll each cookie in powdered sugar until evenly coated. 8. Cool cookies completely on wire racks. Once the cookies have cooled completely, roll the cookies in powdered sugar a second time once. absolutely delicious cookies. I always make them with almonds, want to try this recipe with walnuts next time. 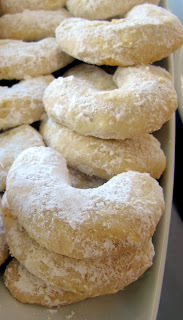 When I get over my sugar high from the holidays these are next on my list, maybe after your Portuguese honey cakes. What a nice compliment from the chef! They look wonderful! These sure look wonderful; I used to make them with pecans. 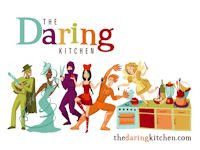 Going to check you out your recipes. love to find another Canadian Blogger.